Stenotrophomonas maltophilia colony morphology and microscopic appearance, basic characteristic and tests for the identification of Stenotrophomonas maltophilia. Images of Stenotrophomonas maltophilia. Stenotrophomonas maltophilia is a straight, Gram-negative rod. These bacteria are motile due to the presence of 4 polar flagella. They are catalase positive, and most are either negative or weakly oxidase positive. 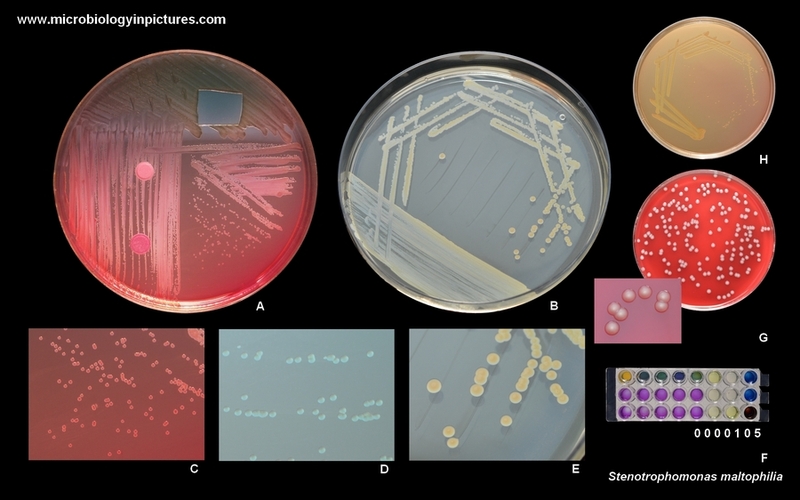 They grow on MacConkey agar and appear to be nonfermenters (lactose negative colonies on Endo agar (A, C), CLED (D) and MacConkey agar (H). They form small colonies after 24 hours at 37 °C on solid cultivation media (A, C, D, H) and medium, smooth, convex colonies about 3 mm in diameter after 48 hours (B, E, G). S. maltophilia usually produce yellowish soluble pigment. B, E: Mueller-Hinton agar, 48 hours, 37 °C. Stenotrophomonas maltophilia has previously been referred to as Pseudomonas maltophilia and subsequently Xanthomonas maltophilia. S. maltophilia is an opportunistic pathogen which is commonly found in and around water, both in the wider environment and in hospitals. It can survive a very minimal nutrient concentration. It can also form biofilms on plastic surfaces, so can therefore be found on medical devices e.g. nebulisers and cannulas. It has optimal growth at 35 °C, no growth at 4 °C or 41 °C but can survive refrigeration. It most commonly causes respiratory infections in humans. Human infection is relatively rare but is becoming more prevalent especially in hospital settings. S. maltophilia infection is much more common in cystic fibrosis patients as well as obstructive lung cancer patients. S. maltophilia is also able to cause other infections including bacteraemia, meningitis, cellulitis, and eye infections. It also causes infections in the general community outside the hospital setting, but this is even more rare. S. maltophilia may be associated with polymicrobial infections or grow slowly in the host, resulting in some difficulty in isolating this bacterium. It is occasionally misidentified as Burkholderia cepacia (previously known as Pseudomonas cepacia), which is also a common Cystic Fibrosis-associated pathogen. Should be always guided by in vitro susceptibility tests!! Selection of appropriate antibiotics depends on diagnosis!! S. maltophilia is difficult to treat, having already shown resistance to TMP-SMX, β-lactam antibiotics, macrolides, fluoroquinolones, aminoglycosides, chloramphenicol, tetracyclines, and polymyxins. Its metabolic pathways may even enable it to use some antibiotics as a food source. NOTE: S. maltophilia isolates can exhibit differences in antimicrobial susceptibility depending on the temperature they are incubated at (higher resistance is typically observed at temperatures that are closer to 37 ºC). From https://www.ncbi.nlm.nih.gov.